NASA is funding work on a new propulsion system that may enable a 10-kilogram (22-point) CubeSat mission to Europa. Nathan Jarred of the Universities Space Research Association has received a $100,000 Phase I award from the NASA Institute of Advanced Concepts to study a dual-mode propulsion concept that pairs electric and thermal propulsion. High-efficiency electric propulsion would be used for interplanetary maneuvers, with higher-thrust thermal propulsion reserved for quick Earth orbit escape, drastic orbital maneuvering and orbital insertion at the destination. Jarred will use the NIAC money to design and optimize the various components of the overall system. He will also design an experiment to evaluate propellant performance within the thermal mode using existing hardware at the Center for Space Nuclear Research. CubeSat technologies may be the antidote to the growing cost of NASA interplanetary missions. 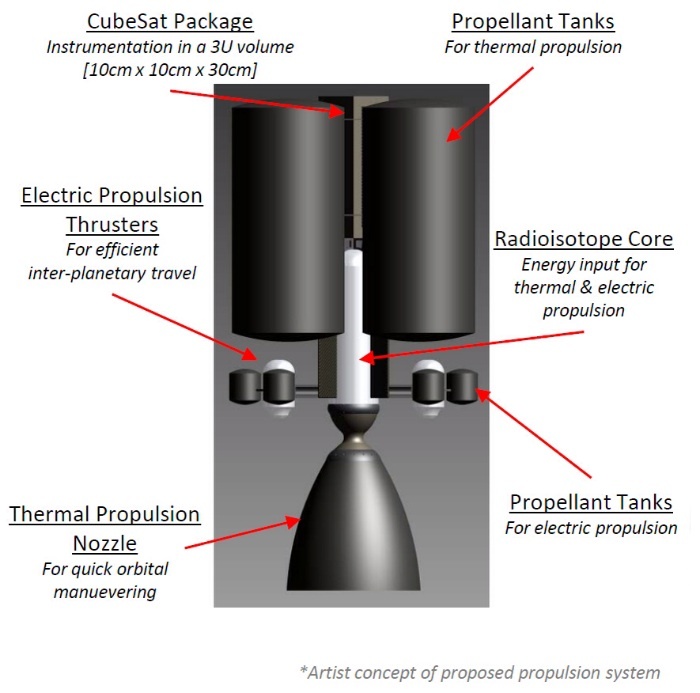 The interplanetary CubeSat missions currently under study are generally limited to the inner solar system, however, due to the propulsion problem. New concepts like this one could change that. The drawing is OK for a start, but where are the radiators, turbines, pumps, generators, and plumbing? The major problem with any electric rocket is the power source. Involving radio-isotopes will take any non-government project right out of reality. It’s difficult for even NASA to get to do it. Then, what data transmission do you plan? For Microlaunchers it is to be diode laser, and that would work. What do you plan? The NASA Institute of Advanced Concepts is not “non-governmental.” NASA is part of the United States government. We don’t plan to do anything for data transmission because this isn’t our mission.